St Nikolaus-Hospital Cusanusstift is the oldest estate in the Middle Mosel region, founded in 1458 by philosopher Nikolaus von Kues, the best known ancestor of the town of Bernkastel-Kues. He became Bishop and Cardinal then founded the St Nikolaus Hospital, a social service institution that has been functioning since 1465. 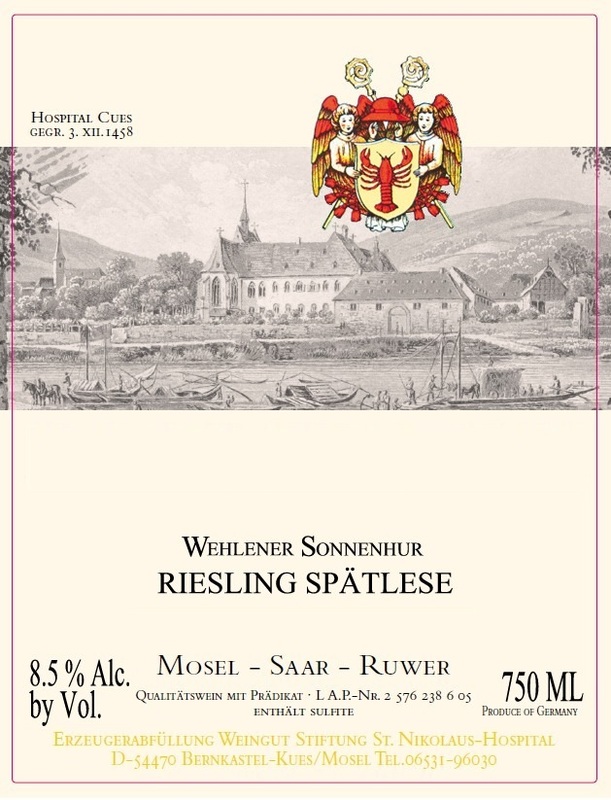 Over the years, this award-winning producer has received numerous medals for his wines, and is a member of the "Bernkasteler Ring". The equipment at the winery is state of the art and the winemakers are among the finest ones in Germany. The estate also operates the Vinothek, one of Europe's most beautiful tasting facilities which gathers 140 of Germany's top producers and represents a major tourist destination. The vineyard is located along the Mosel River and measures 15 hectares (37.05 acres) total, including the following sites: Wehlener Sonnenuhr, Graacher Himmelreich, Graacher Domprobst, Bernkastler Badstube, Bernkastler Graben, Brauneberger Juffer and Braunberger Juffer-Sonnenuhr. The 40 year-old vines are planted on steep, slate soil. Chavy-Chouet Bourgogne Blanc Les Saussots is made from 100 percent Chardonnay. A medium yellow straw color in the glass. On the nose, you will find layers aromas of cured lemon and hints of coconut and mango. On the palate, the juice has clean flavor, fresh acidity, and excellent balance. Vanilla notes follow through to the slightly creamy finish. The grapes from this wines are grown from the Meursault area. (either outside of the AOC limit or with younger vines). Seafood, fish, salad or by itself as an aperitif. Drink this one now or over the next 3 to 4 years.